If you are using Bitmain AntMiner U1 USB Bitcoin ASIC miners there is something important that you should be well aware of in order to get the maximum performance and ensure optimal stability on the long run for these devices. Obviously we are going to be talking about power consumption and usage of these small ASIC miners that are designed to be powered by USB. The manufacturer has rated them at 2 watt power consumption from the USB port with a hasrate of 1.6 GH/s and tha is leaving you about 0.5W headroom for overclocking before reaching the maximum power that a normal USB 2.0 port can provide you with. 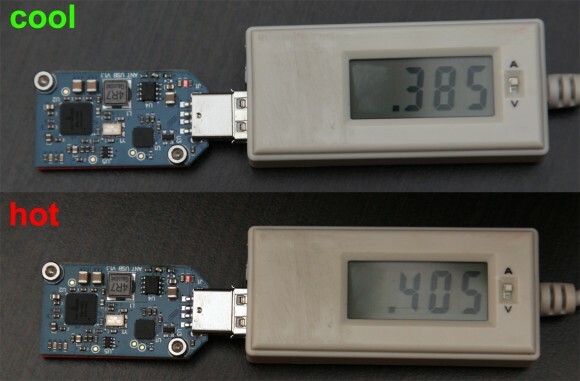 But we decided to check if the Bitmain rating is rally true and to see for ourselves what is the actual power consumption of the AntiMiner U1 devices. As you can see on the photo above the power usage of the U1 miner is just 0.086A at 5V or a total of 0.43 watts is what you get with the device connected to a PC, but with no mining software running. 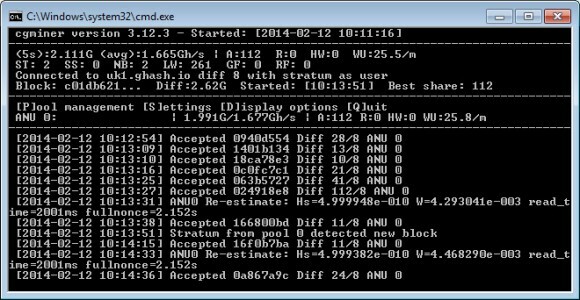 As soon as you fire up cgminer or another compatible mining software and the AntMiner U1 starts working at 1.6 GH/s the power consumption increases significantly that what you get in idle mode. At first we’ve measured 0.385A current used or about 1.925 watts – a bit below the manufacturer’s rating, however this is the power usage while the device is still cool. Just a few minutes later since everything gets hotter (thermal images) after the AntMiner U1 starts operating and the power usage increases along with the temperature of the chips. In just about 10 minutes after starting to mine with the device the current usage increases to 0.405A or a total of 2.025W of power, something that does not seem that much higher at first, but as you start to overclock the device you will notice that the gap between a well cooled AntMiner U1 and a very hot miner increases. The problem is that the higher power consumption leads to more heat and can also result in less performance when overclocking. As you can see from the results above hitting 2.2 GH/s on a USB 2.0 port was not possible as we were hitting the limit of the power the interface can provide already at 2 GH/s. Moving to USB 3.0 we could squeeze up to 2.6 GH/s by increasing the operating frequency of the device and having more power available to use from the USB port. Have in mind that overclocking the device requires an adequate cooling to be provided, so you need to be prepared for that before starting to go past the “stock” 1.6 GH/s hashrate. As you can see from our results the maximum we could get was below the maximum power the USB 3.0 interface can provide, the reason for that is that for higher performance you would also have to increase the voltage that the processor of the device operates at (default 0.8V) in order for it to continue working fine at a higher frequency. This can be done by replacing two resistors on the device and the procedure is described in the AntMiner U1 manual. Have in mind though that increasing the voltage can damage the device, so do have in mind should you decide to go for a hardware modification for even higher performance. Increasing the voltage will also seriously increase the power consumption and will require even better cooling in order not to overheat the miner! The above example will run the AntMiner U1 at 200 MHz and should produce a hasrate of about 1.6GH/s, by increasing the frequency number to 250 for example you can get 2 GH/s hashrate and 275 should get you 2.2 GH/s. Do have in mind that overclocking the AntMiner U1 should be done only after you add a cooling fan to improve the operating temperature of the device. We’ve already measured the operating temperature of the AntMiner U1 at 1.6 GH/s and they do get quite hot even at “stock” frequency. Don’t forget to change the pol and worker/password with your own settings!